Guggulu is an oleo-gum resin which exudes out as a result of injury from the bark of Commiphora wightii(Arnott) Bhandari [syn. Commiphora mukul (Hook. Ex Stocks) Engl; Balsamodendron mukul (Hook. Ex Stocks); Family, Burseraceae]. 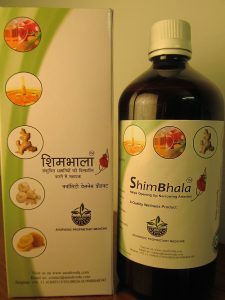 Hypolipidemic Activity – The lipid lowering effect of guggulu with special reference to atherosclerosis and obesity (medoraga) was first reported in a doctorate thesis submitted to the Banaras Hindu University (BHU) in January 1966. In numerous clinical studies carried out (over a period of two years) on rabbits, in which hyperlipidemia was induced, it was demonstrated that crude guggulu lowered the serum cholesterol in hypercholesterolemic rabbits significantly and also protected these animals against cholesterol-induced atherosclerosis at the fatty streak stage. It also reduced the body weight of the animals. A similar trending in patients was recorded of reduction in serum cholesterol levels in patients with obesity and hypercholesterolemia in clinical studies with crude guggulu. Clinical studies on C. mukul showed its hypolipidemic effect and the outcome of change in lipid profile upon its administration. This study showed significant decrease in total cholesterol and LDL cholesterol after treatment with guggulu. The antioxidant property of guggulu helped stop the oxidation of cholesterol and subsequent hardening of the arteries, reduced the stickiness of platelet, and also lowered the risk of coronary artery disease. It also enhanced the production of thyroxin and triiodothyronine; these hormones increase the metabolism of carbohydrates and protein synthesis and help in lowering the lipid activity. Thus, the protective action of guggulsterone might also be due to free radical scavenging property. The metal chelating capacity of guggulsterone might be contributing to its antioxidant activity. Also, the alcoholic extract of C. mukul exhibited antioxidant property. Anti-atherosclerotic Activity – LDL accumulates in atherosclerotic lesions and is the major source of the cholesterol accumulation in human foam cells. There is evidence that LDL oxidation is essential for atherogenesis and the antioxidants that prevent this oxidation may either slow down or prevent atherogenesis. Guggulsterones, the lipid-lowering components of guggulu, effectively inhibited in vitro LDL oxidation (as discussed under antioxidant action). Thus the combination of antioxidant and lipid-lowering properties of guggulu makes it especially beneficial against atherogenesis.